Continuing the industry trend for announcing NAMM show products ahead of the actual NAMM show is IK Multimedia, who has taken the wraps off its new stompbox controller for iOS devices: the iRig Stomp. The reason we're all so excited about this little box of blackness (IK Multimedia clearly doesn't come from the Z.Vex school of decoration) is that it can be incorporated into a pedal board, allowing the use of iOS guitar apps in a live performance. Other features include a bypass switch, a battery-powered active output circuit and an oversized gain knob. This will be great for the mobile tone tinkerers out there, as it means those sounds that you've spent hours crafting on your iPhone or iPad will effectively be freed from their glass cages, without the need for extra converter cables. 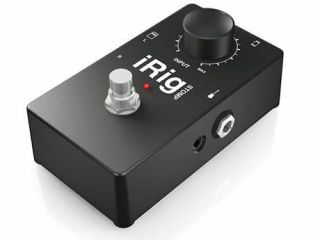 The iRig Stomp should be available early Spring. A UK price is yet to be confirmed, but currently it has a European MSRP of €44.99, excluding tax, which should work out at about £44.50 in sterling and with VAT added. Keep an eye on TG for more product news, videos and reports from NAMM 2012.